Continue your search for the Canadian big foot by turning the cards to reveal the clues to his whereabouts. This scratch card game revolves around a group of campers quest to discover the hairy beast. Uncover 3 big foot cards to locate the mammal and claim the biggest prize. NextGen delivers original and creative products with innovative game design choices. The company has been founded almost two decades ago and provides extraordinary entertainment ever since. The developer team prides themselves of high-quality video slots and the energetic dynamic. With a wide range of different themes there is a game for everyone in their repertoire. NextGen is very popular amongst their audience as they provide exciting gameplay experiences and have become one of the market leaders, always delivering entertaining and engaging games. 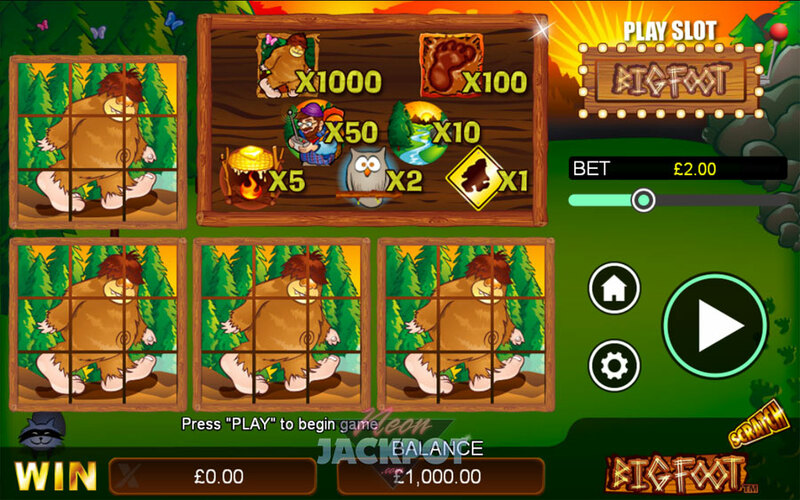 This is the scratch version of the Bigfoot video slot. The art-style is pretty much identical to the slot and the theme stays the same adventurous hunt after the mysterious and legendary creature living in the deepest forest. Try your luck to find Bigfoot and take big wins home with you if you do. You can see a national park in the background where the sun is slowly rising over the horizon. There are also some suspicious foot prints in a line that will lead you to the wanted Bigfoot. On the center top of the screen is the paytable to make it easy to understand what kind of symbols you want to match. To win you have to match three identical symbols of the paytable. Unlike most scratch card games from NextGen this one features four cards at once that are spread around the left side of the paytable. This will increase your chances to match symbols and take nice wins with you. To the right side of the screen are all important game controls and a button leading to the original video slot version. The back of all scratch cards is the Bigfoot himself. You can decide if you want to reveal all cards and positions at the same time or if you want to scratch off each position one by one. The symbols that you can find when uncovering your cards is bigfoot himself, he will also payout the most, his footprint in the mud, a camper looking for bigfoot too, a beautiful landscape with a river crossing through the middle, an open campfire, a cute night owl and a sign advising of Bigfoot. To buy yourself some cards you will have to place a minimum bet of 1p or up to 2,50 pounds. With the 4 scratch cards your chances of matching three symbols are increased and the game will offer an immersive gameplay. The animations are nicely done and give a nice touch to the overall game feel. You will always see what position is currently uncovering and if you win the matching symbols are highlighted and the win displayed in the middle. 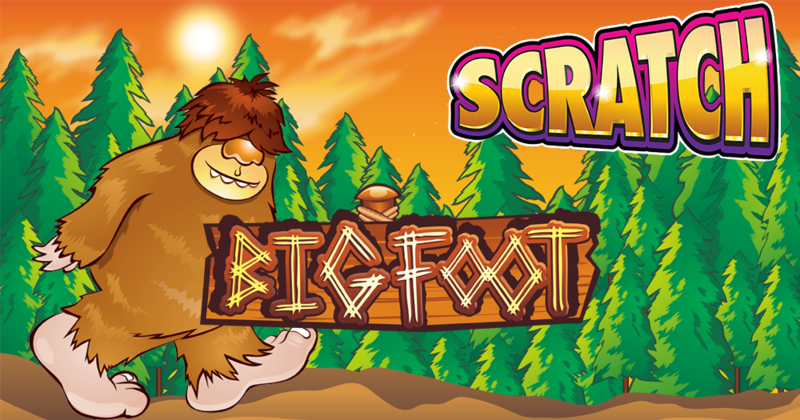 Bigfoot Scratch is a great adaption of the original video slot. It has a nice comic art-style that represents the theme quite well. The symbols are all theme related which makes this game more engaging as everything is part of the same universe. The starting bet is very low which makes it great to start with. The mechanics are very clear and you will quickly immerse into the game flow. Bigfoot Scratch provides a great and relaxing gameplay experience.